They want to hire your small business. Discover opportunities. Master the process. Pitch your solutions. 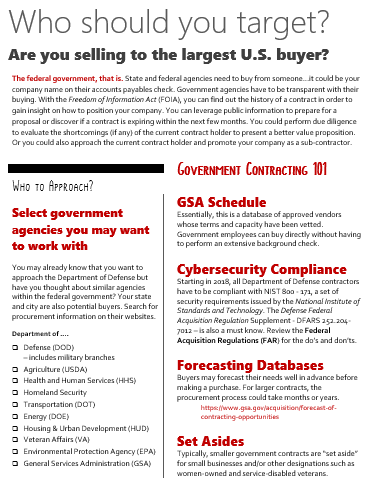 Gain confidence to grow your existing small business by bidding on government and corporate contracts. You could pay thousands of dollars for a consultant to tell you the same instructions that are clearly laid out in this book. Ever heard of the Billion Dollar Roundtable®? Companies spend beaucoup dollars with small businesses yet only a small percentage of talented business owners pursue these opportunities. 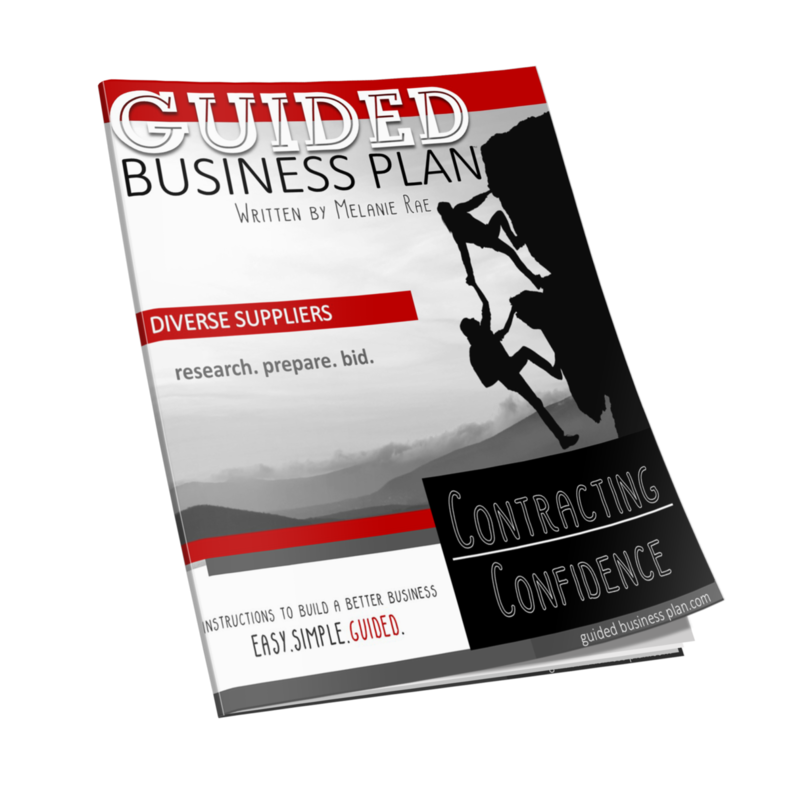 Our GUIDED Business Plan™ | Contracting Confidence book will show you how to introduce your company with a capability statement, generate meaningful content that is crucial in a proposal, and pull together the right endorsements and support team for your proposal. This book was designed for microenterprises that have a small team, big ideas, and modest bank accounts. The first chapter answers the “what’s in it for me” question by sharing websites to find ideal contracts. Our books have inspired thousands. Hear from a few of them. Are you passing on the opportunity to become a 7-figure company? Government and corporate agencies buy just about everything. If the same vendors keep applying for the contract, then they are going to get it. Only a tiny fraction of capable businesses are introducing their company’s solutions to buyers with larger budget. Will you be next? 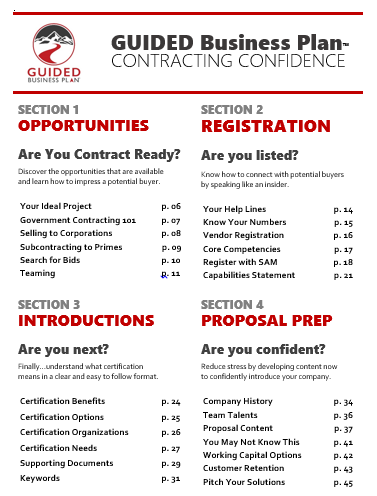 Please share your progress with us via Twitter @GuidedBusiness #GBPContracts. Thank you! Join a special list just for suppliers and SD&I professionals. Discounts are available for not-for-profit organizations. Digital Toolkit: Complimentary. 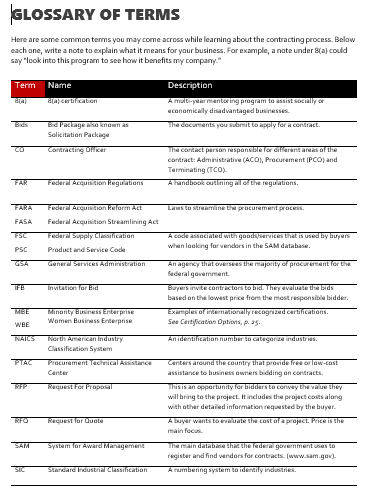 Organize your process with our GUIDED Bid Journal spreadsheet. individual orders. Allow up to two business days to process your order. Back-order may take 7 business days. Return Policy | All sales are final. Great care is taken to remove typos and grammatical errors. While rare, a book may be printed incorrectly and we will gladly replace the book upon receipt of a picture of the error. Strategic Growth Plans and Supplier Development Programs: Small Business Development Centers (SBDC), Women’s Business Centers (WBC), Minority Business Development Agency (MBDA), corporate Supplier Diversity and Inclusion divisions, state and municipal Economic Development Departments, Microenterprise Centers, Accelerators and certification agencies such as WBECN, NMSDC, National Veterans Council, NAVOBA and NGLCC. Impress your decision makers. The first time. This book was designed for microenterprises that have a small team, big ideas, and modest bank accounts. The first chapter answers the “what’s in it for me” question by sharing websites to find ideal contracts. Learn tips to appear in search results more often and how to introduce your company’s solutions to buyers. Develop marketing tools and proposal content to avoid the common mistakes of others. rates apply. Back-order may take 7 business days. 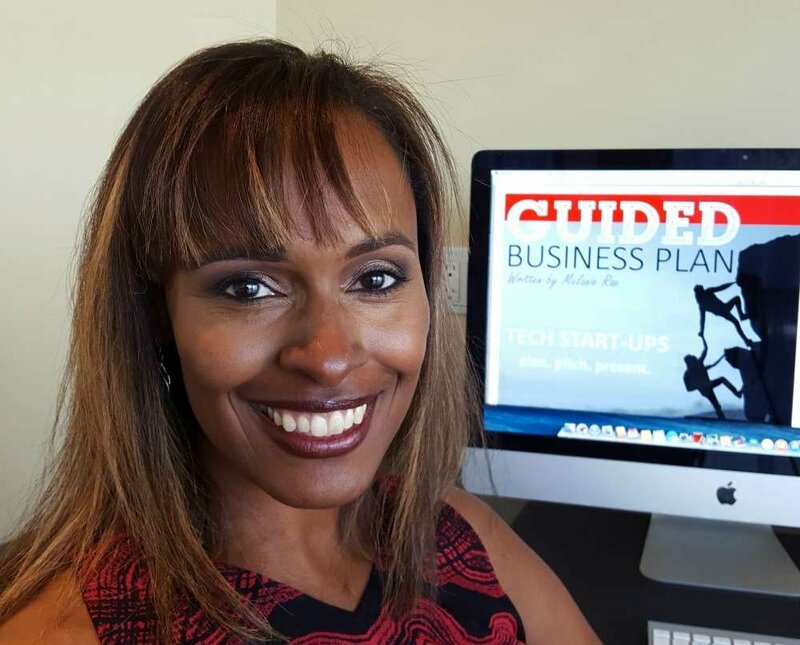 Strategic planning programs at Small Business Development Centers, Women’s Business Centers, Minority Business Development Agency, corporate Supplier Diversity divisions, municipal Economic Development Departments, Microenterprise Centers, and certification agencies such as WBEC, VET Biz, and Minority Business Development Council.